Front Binding – Happy Fourth of July, everyone! I’ve decided to bump up a Heritage Press title for the holiday, and I happen to have one quite apropos for today: The Autobiography of Benjamin Franklin, one of the all-time legends in non-fiction and arguably the most famous memoir ever written (at least by an American!). Franklin, of course, was one of the Founding Fathers of America, but he wore many other hats during his long life: inventor, banker, post officer, businessman, printer, newspaperman, diplomat, writer, and scientist. The book was a project that he didn’t fully finish before his death (and as Carl Van Doren notes, was written in a blistering four months), but he was still able to document fifty or so years of his busy, industrious life. This is the Heritage version of the work; Macy commissioned renowned printer John Henry Nash to print a LEC back in 1931 as the first title in the 3rd series. 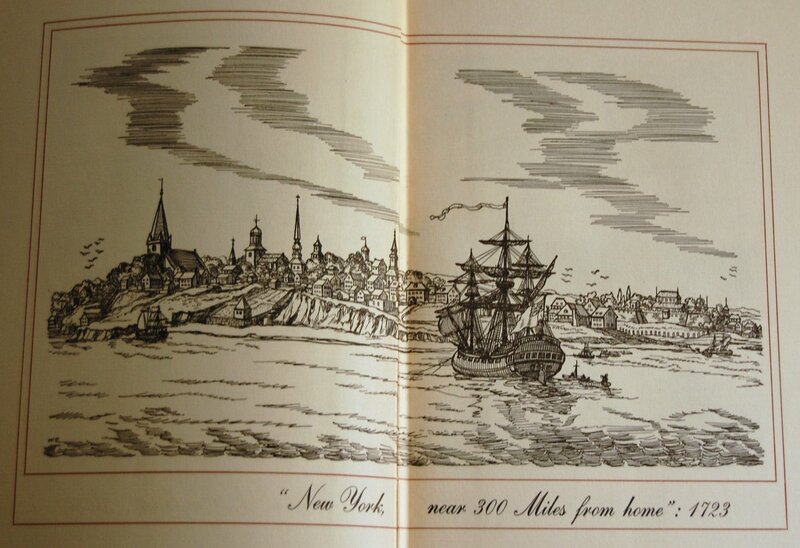 William Wilke served as illustrator for that edition, although it was Nash who ultimately signed the colophon. Franklin would also have his Poor Farmer’s Almanacks printed by both presses in 1964, which featured the paintings of Norman Rockwell. For this Heritage original, Macy hired William Sharp to do the honors of rendering Franklin’s world in line drawings, a task he has performed multiple times for the George Macy Company. As previously covered, Sharp brought the lives of Rousseau and Pepys to Macy’s editions of those works, so he was certainly not a stranger to chronicling the authors in illustration (Rousseau did follow this work, mind). For Sharp’s bibliography, please see the post on Pepys. Design Notes – …I have none! Alas, I have no Sandglass and this stands as an original Heritage. There is also no colophon to work from. Once I have some production details, I will happily elaborate. Title Page – Carl Van Doren, who I briefly mentioned above, provides an Introduction. What’s kind of neat about this edition is that Macy had the text taken directly from Franklin’s original manuscript stored at the Huntington Library in Pasadena. The outline, included here as well, came from the Pierpont Morgan Library in New York. Front Endpapers (2) – Sharp kicks off the book with a lovely set of four landscape drawings. This is the second. 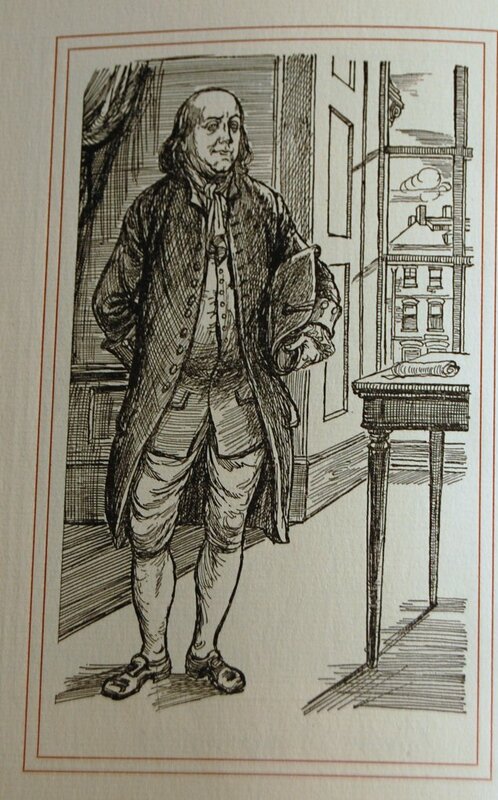 Pre-title Page – A well-executed sketch of the author. Sharp certainly had a talent for these biographical works. Personal Notes – This was another book sent to me recently by Liz. I’m happy to have it join my collection! 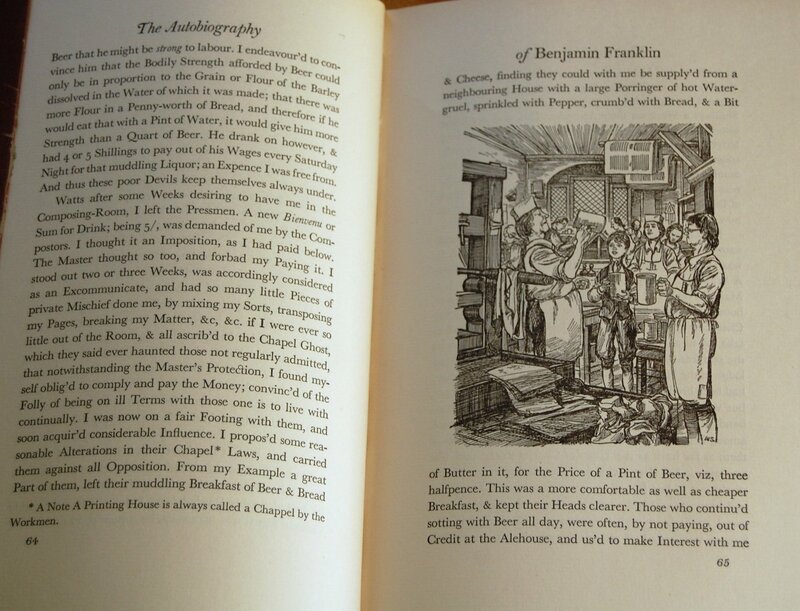 You are currently reading Heritage Press: The Autobiography of Benjamin Franklin (1951) at The George Macy Imagery.